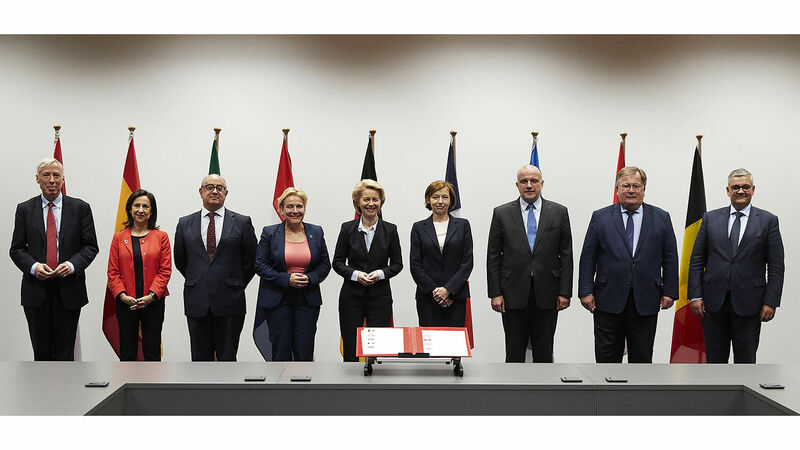 EU defense ministers pose after signing the European Intervention Initiative in Luxembourg on June 25. Nine European countries have agreed to join a new military coalition specializing in rapid deployments in times of crisis. France, Germany, Belgium, Denmark, the Netherlands, Estonia, Spain, Portugal and Britain all signed a letter of intent on June 25 to get the project started. The European Intervention Initiative (eii) will launch with meetings as early as September this year. It is open to European Union members and nonmembers, since it will work outside the framework of the EU and will not be subject to prolonged votes within the Union. “The deadlines and decisions in the EU are still much too long compared to the urgency that can arise from a critical situation in a country where Europeans would consider that there is a strong stake for their security,” said French Defense Minister Florence Parly. This nine-country force demonstrates Europe’s desire for fast-acting military power. The eii is the latest effort to forge this power. Brexit, the migration crisis, terrorism, America’s increasing isolationism, and the rise of Russia are adding to Europe’s appetite for militiary power. Europeans want their own united military power! They know that a political union of Europe would produce a third major world power, as strong as either the U.S. or the ussr—possibly stronger! The books of Daniel and Revelation contain extensive prophecies about “ten kings” who will band together as a United States of Europe, following the mold of the Holy Roman Empire. Revelation 17:12 discusses “ten kings, which have received no kingdom as yet; but receive power as kings one hour with the beast.” They have no kingdom individually, but will rule together as part of the beast power. Europe’s recent military initiative shows its increasing desire to forge such a power. Read our Trend article “Europe’s Push Toward a Unified Military” for more on this subject.